A new £1.4bn shopping centre could be the "catalyst" that boosts the fortunes of a London borough. Croydon Council gave permission on Tuesday for a Westfield shopping complex to be built - the third of its kind in London. The new mall will create thousands of jobs and inject millions into the south London borough's economy. Work to demolish the existing Whitgift Centre will begin in 2018, with Westfield aiming to be open by 2022. Compared to the other two Westfield shopping centres in London - one in White City and the other in Stratford - the Croydon complex will be the smallest. Along with shops, restaurants and leisure facilities, it will also see hundreds of new homes built. It is hoped Westfield will not just rejuvenate Croydon, but attract shoppers from outside the borough. Due to the size of the development, the plans will need to be approved by the Mayor of London. What will be in Westfield Croydon? The shopping centre will be across three levels and have space for about 110 shops and restaurants. As yet, there is no confirmation of which brands will feature but there will be a new flagship Marks & Spencer to replace the current store on North End. There would also be potential for a cinema and space for either a 250-bed hotel or 500-bed student accommodation. And 3,140 car parking spaces are planned plus an initial 300 spaces for cyclists. The scheme will also see between 626 and 967 flats built, set in four or five separate tower blocks along the front of Wellesley Road. What could Westfield mean for Croydon? News of the development has been welcomed by two of the borough's businessmen. 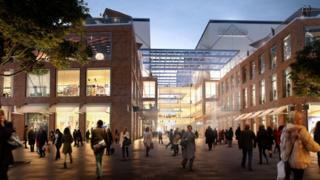 Matthew Sims, CEO of the Croydon Business Improvement District (BID), said Westfield "is being seen as the catalyst". "One of the major benefits is the amount of jobs it will be creating and the legacy it will leave," he said. It is estimated the new shopping centre will create up to 7,048 jobs. "As a BID we will look to make sure they go to local people. There will also be obvious economic benefits. "Ultimately I think it is a development which will make people take Croydon seriously." And Roger Wade, CEO of Boxpark, which opened its second London branch in Croydon in October 2016, also warmed to Westfield's ambitious plans. He said: "It's something I welcome. Westfield is something which is going to have a vital impact. "We have to embrace change and we should be encouraging developments of this size coming to Croydon." What has Westfield done for other parts of London? Westfield London opened in White City in October 2008 and was followed by Westfield Stratford City three years later. In 2016 Westfield said its White City shopping centre attracted a footfall of 27.3m and achieved retail sales of £996m. Graeme Bright, chair of the Stratford Original Management Board, said the area has noticed an improvement since Westfield's arrival. He said: "Westfield is a destination shopping centre. People now come to Stratford and we have noticed an increase, of about 10-15%, in our [town centre] footfall since Westfield was completed. "It has obviously magnified Stratford for the right reasons and a lot of people travel to come here because of it. "Westfield really has put Stratford on the map and it has given the area some phenomenal job opportunities." Developers Hammerson and Westfield came together to form the Croydon Partnership in 2013 as they pushed forward their plans to transform the town centre. Hammerson was founded in 1942 and is a major British property development and investment company. The company has a multi-billion pound portfolio, including the Bullring shopping centre in Birmingham and the Union Square shopping centre in Aberdeen. Westfield currently has interests in 35 shopping centres in the US and the UK - it also has plans to open a mall in Milan, Italy by 2020.